This has been something that arrived out of the blue after a crazy wedding weekend…ricotta is an ingredient I like to put everywhere, and I love it particularly in desserts. On my last trip to France, I bought a pain d’épices spices mix. I have wanted to make pain d’épices for a long time, it literally translates to “spiced bread” and is a wonderful and spicy cake from Alsace, my neighboring region. The base of the cake is honey and lots of spices, it has a dark brownish color, and is quite sweet. Kids love it. Even though you can find many variations to the cake, the city of Reims has its own, the city of Dijon as well. In Alsace you can find a Pain d’épices Museum that retraces the history of that cake with all the tools developed for its fabrication. I would certainly not call this cake a pain d’épices, but it does have a few important ingredients that pain d’épice has such as the spices and the honey, so there is an after taste of pain d’épices. The spice mix I used is composed of star anise, cinnamon, cardamom and clove. Since I don’t like cinnamon that much, I did not add too much, but I know that Americans are very fond of that spice, so whoever likes it can add more if desired. For those who won’t have the spice mix available, I would just use the loose spices powder. The ricotta made this cake very moist and soft and the spices are not overpowering, so it turned out really well. To be enjoyed with a nice hot cup of tea a bowl of fresh fruits or whatever you feel like having. In a mixing bowl, mix eggs, sugar, honey then add ricotta. Add oil. Mix well. Add liquor. Add flour and baking powder and baking soda. Mix well. Add spices, lemon zest, and dried fruits. Mix well to get a smooth consistency. Bake in a non-stick deep dish, in a 375F pre-heated oven for about 45 minutes, check after 30 min. to see how the cakes comes along, and keep cooking or until the cake is cooked all the way through. This entry was posted by silvia on August 15, 2009 at 10:15 am, and is filed under Breakfast/Brunch, Desserts. Follow any responses to this post through RSS 2.0.You can leave a response or trackback from your own site. 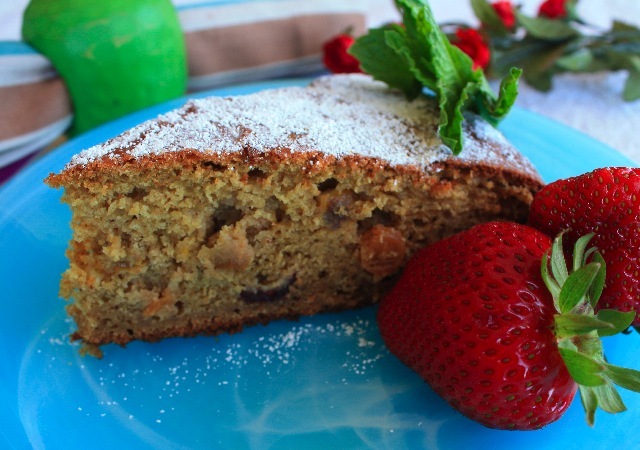 I love spiced breads… The flavors sound wonderful! Wow ! Yummy ! best without herbal liquor for me. Yeah ! Thank you for sharing. Cheers ! Great post! This cake looks so moist and flavorful. This is a great transitional cake between summer and fall flavors. Oh wow, this looks heavenly. So many of my favorite things. Is there nothing cake can’t do? ?